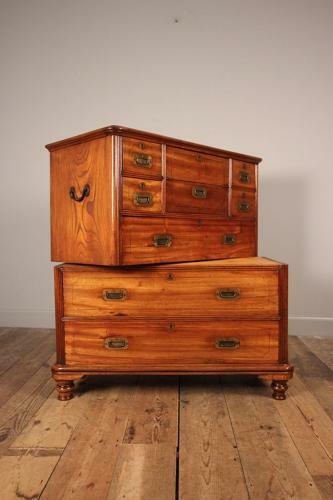 A beautifully proportioned small Campaign Military Chest, made from solid camphor wood with wonderful colour and lustre. The chest retaining the original inset brass handles and escutcheons with Ebony line decoration to the drawer fronts. This piece splits in to sections from original and retains the brass carrying handles. Having an arrangement of 4 small and one secretaire drawers which opening to reveal a writing slope with a storage well and and further drawer inside. The whole raised on turned feet.